December 12, 2016 May 15, 2018 ~ Steve N.
Darden sold off the Red Lobster brand in 2014. Red Lobster had been bleeding customers (and cash) for years, and it was a drag on Darden’s bottom line, so they cut it loose. But for whatever reason, the gift card was still valid at Red Lobster. I hadn’t eaten at Red Lobster in about 12 years, and my recollection was that it wasn’t very good. I was curious if the new owners had improved the menu, so Red Lobster was where we spent the gift card, though I do see an Olive Garden edition of Bad Chain Restaurants in the blog’s future. Red Lobster is famous for the warm biscuits they serve at the beginning of the meal. People rave about them. They go gaga for them. These things are supposedly the bomb. They’re billed as ‘cheddar bay biscuits,’ and from what I can tell, they’re standard drop biscuits but with cheddar, garlic powder and a little bit of dried parsley added. The hype is entirely lost on me. They’re nothing special. They’re not bad, but I don’t get why people go crazy over them. The flavor profile is of regular biscuits from a boxed (processed) mix. You can’t taste the cheese. The texture is not exceptional, and the only thing they have going for them is that they’re served warm. Ostensibly, nobody goes to Red Lobster for the over-hyped biscuits; they go there for the seafood. And that was my focus; I was very curious if the lobster tails particularly were any good. Red Lobster does have live (whole) lobster, which you can get steamed or roasted and I’m sure as long as they don’t cook the crap out of it, it’s decent. It’s hard to screw that up. But I doubt they sell much live lobster. Most of the dishes that have lobster in them contain split lobster tails, which I’m now convinced are of low quality and frozen. I ordered the Bar Harbor Lobster Bake. Roasted ‘petite’ lobster tails, scallops, mussels, and shrimp served over linguine with tomatoes in a white wine garlic sauce. I liked this because of all the shellfish, the light sauce, and I could also gauge the quality of the lobster tails. I had hoped it would be tasty, especially given its outrageous $30 price tag. If you look at the photo on the menu, the dish looks small, which would make sense if the seafood were of high quality. Silly me. You’d think I’d learn my lesson and not believe the marketing photos. 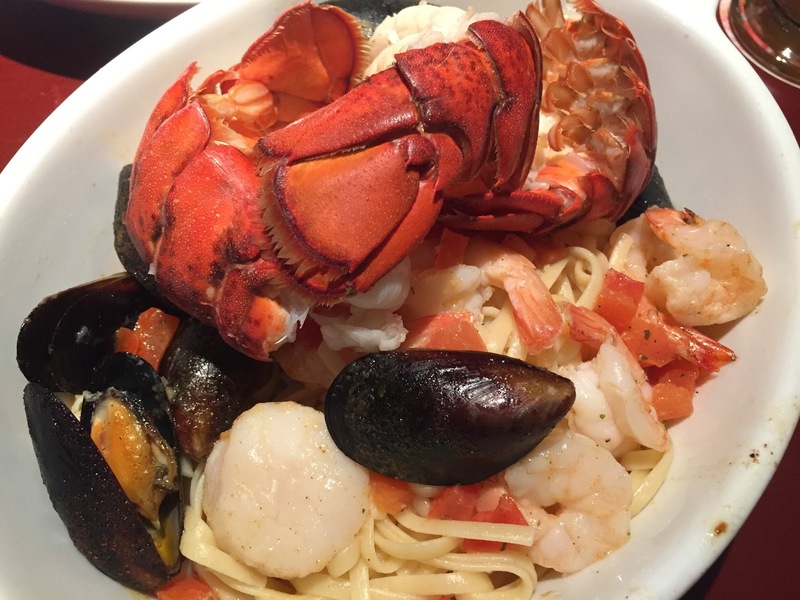 What I received was a giant dish of pasta with bits of tomato topped with shellfish sitting in a pool of butter, with a side cup of more melted butter. Oddly, the dish came covered with a plastic dome—ala hospital food. It tasted like hospital food. 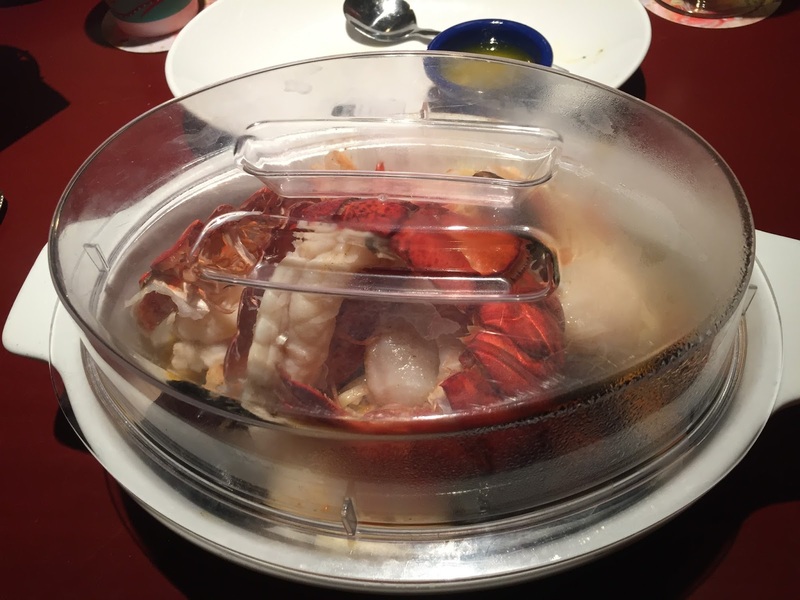 The lobster was rubbery and had little flavor. There were loads of small tail-on shrimp (which made it harder to eat, peeling all those tiny shrimp was a pain). The shrimp though tender had no flavor. The scallops were ok but lacked the sweetness one expects of scallops. The mussels fared the best, but three of the seven or so mussels in my dish didn’t open up, they were bad, and I couldn’t eat them. That’s a no-no of course. Any bivalves that don’t open up during cooking should be separated and thrown out. Had I not seen the tiny cubes of tomato there would be no way to know they were in the dish, I couldn’t taste them. The white wine garlic sauce tasted like butter and nothing else, it had no depth of flavor, no complexity and if there’s was wine in there, they did a great job of hiding it. At least the pasta wasn’t overcooked. My wife ordered salmon with Brussels sprouts and sweet potatoes. She liked the dish and said she would get it again. I tasted the sweet potatoes and the Brussels and thought they were good, but a little too sweet for my liking (the potatoes had maple syrup in them, and the Brussels were covered in a sweet glaze). There’s no doubt I ordered wrong, if I ever return to Red Lobster, the fresh fish and sides are what I’ll get. I’m going to go out on a limb and submit that the vast majority of regulars to Red Lobster are not getting the live lobster or one of the fresh fish options, they are eating the shellfish. Shellfish and shrimp especially is big, and it’s on every single combo entree. Most of those combo entrees have two portions of shrimp, and all are drenched in a sweet and/or salty sauce, or they’re breaded and fried. Those that aren’t, are accompanied with salty melted butter. The shellfish is flavorless, but who cares when it’s covered in a tasty sauce, or fried and served with a salty/sweet dipping sauce? And I think that’s the appeal of Red Lobster. Its fans are not what their marketing department has claimed for years —”seafood lovers.” They are salt and sugar lovers, and the bland seafood is just a salt and sugar delivery system designed to satiate that craving. The rubbery, dull lobster tails are most egregious. If your only exposure to lobster is a Red Lobster lobster tail, you’ll have no clue just how amazingly delicious lobster can be, and that’s a shame.